Following the success of the first European Outpost, House of Vans London, Manchester has been selected to host a bumper weekend of music, art, street culture and skateboarding. 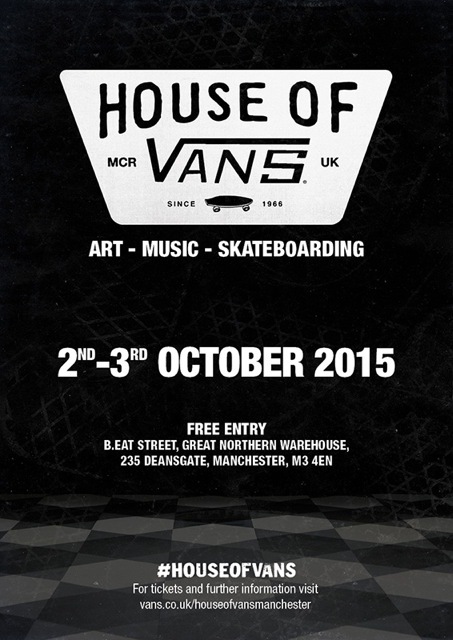 The Great Northern Warehouse in Deansgate will undergo a dramatic transformation into House of Vans Manchester for the two day celebration. The 900 strong venue will welcome an amalgamation of some of the biggest names in Electronic, Dub and Drum & Bass. Jenna & The G's head up the incredible night of music, taking to the stage with her live band. 8 Gold Rings ft Tyler Davey, Sparks and Fox will be delivering a potent mix of Dub and Drum n Bass whilst the likes of Madam X, Roy Davis Jr and Shadow Child plus electronic duo Maribou State, will all be delivering blistering sets throughout the night. An art exhibition will be on display featuring works curated by three specially selected Size? x Vans ambassadors: tattoo artist Jemma Jones, illustrator Jake B and famed street artist Krek. Guests will have the opportunity to leave their mark on House of vans Manchester as Riso printing classes run alongside the exhibition. Ambassadors will be on hand to assist in creating prints that will then be collated and compiled into a commemorative zine. Beyond an awesome line up of local music talent, there is a whole programme of workshops to get involved in. Saturday 3rd of October promises an entire day of varied activities for one and all to come and take part in. Skate Schools will run throughout the afternoon in a dedicated skate area courtesy of Black Sheep Store, as well as pro demonstrations on a custom built obstacle that pays homage to the city of Manchester. Those who are feeling creative have plenty to get stuck into and will walk away with a keepsake - a free customised Vans T-shirt from Man Up Girl! To reserve your tickets - click on the Vans website link below.